Today is 'Felt Friday"! 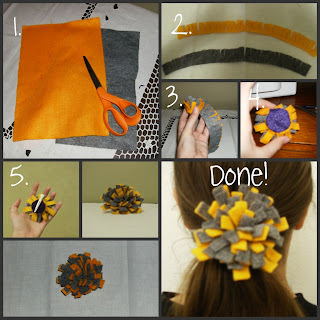 I made an adorable hair clip just using felt and hot glue. It is simple and easy to do in just a few minuets! 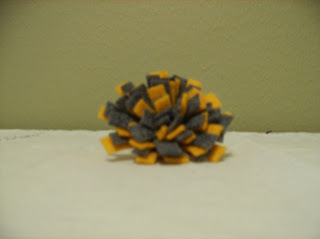 My younger sister asked me to make her a hair accessory in two of her favorite colors; yellow and grey. Here we go! Cut 1 inch thick strips of felt. Cut slits in them about 3/4 in. Don't cut all the way through. Twist the strips into a circle. Repeat, adding a little hot glue as you go. Before we move on, let me tell you a little about myself. I HATE hot glue. It is a sticky, hot mess tat somehow always ends up in my hair. How I wish things could magically stick to themselves. Back to the project. Cut a circle of scrap felt an glue to the bottom. Add a alligator clip and your done! I told you it was easy! Now don't think that I am amazingly smart for coming up with this idea, even though I am:), because Cheri over at I am momma hear me roar actually cam up with this idea. What I did was put two colors together and put it on a clip. I just wanted you to know that so you don't think a am a craft thief or anything of that sort. Thanks for stopping by.